Superb villa with large enclosed grounds and a beautiful private swimming pool. 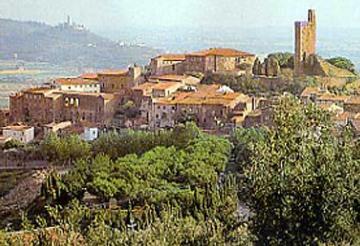 Located on the outskirts of Castiglion Fiorentino. Beautifully restored the villa is set on a hillside commanding views of the Val di Chiana. Shops, restaurants and tennis 1.5km. Coffee bar 1km. Riding 6km. Golf 22km. Cortona 11km. Arezzo 18km. Sienna 62km. Florence 92km. Pisa airport 192km. The second floor has three double bedrooms (1 x 140cm wide bed in each), a twin bedroom (2 x 90cm wide beds), bathroom and a shower room. The first floor (accessed by the exterior staircase and an interior staircase) has a living room with single sofa bed and access to a terrace with views. Two double bedrooms (1 x 140cm wide bed in each), twin bedroom (2 x 90cm wide beds), shower room and a bathroom with hydro-massage. The ground floor has a fully equipped open-plan kitchen and a vast living and dining room with fireplace. Shower room. Laundry room with shower room. Covered dining terrace. The grounds have lawns and numerous olive trees. There is a private tennis court located around two kilometres from the villa which is shared only with the villa Collina Dei Fiori ITA808 and the villa Los Trecentos ITA826. Property made available in good order and fully equipped. Local taxes (unless specified otherwise in the villa description), reasonable consumption of services including water, gas and electricity. Linen and towels (not beach towels) provided. Garden and swimming pool maintenance. Saturday arrival 15.00 to 19.00, depart before 10.00. Pool open from 08/04 to 14/10/2017. Refundable deposit 400€ payable locally. Obligatory final clean 230€. House heating 7€ per hour. Pets supplement 42€ per animal per week.